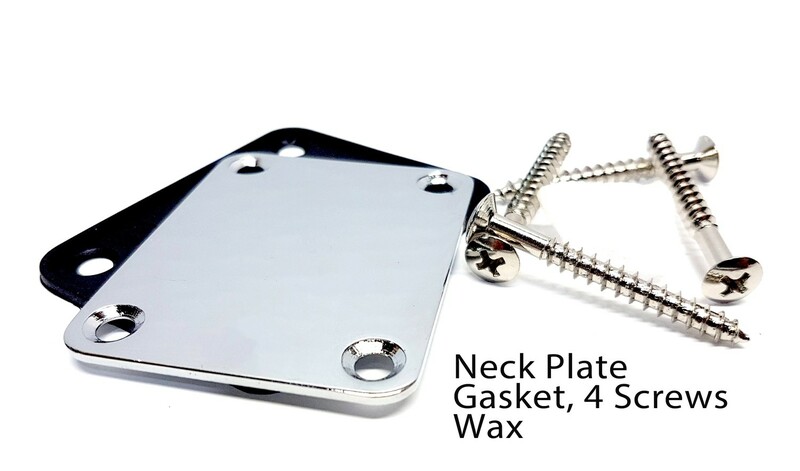 New Carparelli Neck Plates/Screws/Gasket and Wax! As a guitar tech that's built and worked on God knows how many guitars, drilling for Necks MUST be done right. One must always Drill a proper size Pilot Hole and to make life much easier Carparelli added a little chunk of wax in there for lubing your attachment screws. I can pass on my knowledge to the product making your experience that much better. Choose the right one for you! Chrome, Black or Gold. Drill a 5/32" (1.00mm) diameter hole in the neck and a 3/16" (5mm) clearance hole in the body. Rub the Screws into the Wax for a very smooth insert. Helps lubricate the screw for a very easy insert. No creaking or *cracking going on. ( make sure you drill right size pilot hole. These screws can also be used for attaching a tremolo spring mounting claw.